HARD HITTING DETROIT LIONS FORUM - View topic - Who to take at #10? Who to take at #10? I'm sick and tired of early offensive line picks. Gibson was a washout, Stockar isn't very good at all, and Backus is decent, but not spectactular. I would rather get DeMulling(Sp) or Neil and get oliners in the second round, so it isn't as much of a waste if they don't pan out. Just my little rant . I'm going with Barron at this point. While I think the DEs all look good, I'm pretty comfortable with Hall, Redding, DeVries and Edwards on the roster at the position. Unless the club is prepared to move Redding to DT, I just don't see the need. DE is also very deep in this years draft, we can get quality here in the later rounds as well. What I'm not comfortable with is the fact that McDougle is not signed and we are looking at Butler or Rogers at RT and Backus a FA next year at LT. In addition, we haven't settled our left guard spot yet so the OL needs to be addressed. My pick is more based on need than talent at this point. I was also frustrated with all the OL busts during the Ross era. But if you look at the stud OTs in the league (Pace, Jones, etc. ), most of them were high picks. Obviously, you need strong tackles to protect the QB. But with KJ, if Barron can be a stud at RT, you can then look to run Jones on the right side (Barron/Woody) when you need that yard to get a first down and move the chains. This all depends on what happens the rest of FA however. Pablo, you've slowly been winning me over with your OL draft comments. By winning me over, I mean by taking Barron at #10. How much better is Barron than Jamall Brown? I've seen Brown in a couple games and he's a beast. Never seen Barron play though. I'm simply thinking there is a very small need at DE right now and a pretty major need at OT (McDougle is in Miami visiting the Fins). I also am not thrilled with Backus either, so my thinking is that both Tackles spots could use an upgrade. In fact, I'm just not that happy with our offensive line - IMO it is the biggest weak link on the team by far. Given where the Lions are at right now, after signing Kennedy and Pollard, O-Line needs the most attention (followed by backup QB). Breaking in a rookie on the line can be tough, but I'd rather do it at RT this season and move him to LT next season if we don't resign Backus. During his junior season, Alex Barron racked up numerous accolades, including various 1st team All-American lists, and All ACC recognition. He entered his senior year as one of the top offensive line prospects in the country. Alex Barron has a great offensive lineman frame. He is tall, with very long arms, and is lanky, which shows room for growth potential. He is a very good athlete, displaying very good agility in pass protection. He slides well in either direction, and can adjust on the move. His long arms also allow him to lock on to the defender and keep them from getting under his pads. Florida St. often rotates their tackles during games, so Barron has experience on both sides of the line. Barron needs a lot of work on his game, however. He needs a complete overhaul in his run blocking game. He doesn?t play with much strength or aggression when asked to run block. While his lean frame is a plus because he can get bigger and stronger without losing any quickness, it can also hurts him right now. He can be pushed around by college lineman, so it is something he is really going to have to address before he lines up in the NFL. Barron has also had a couple injuries during his time at Florida St. He redshirted his freshman season because of a knee injury, and missed time during his redshirt freshman season to a broken hand. He also sat out spring practice following his junior season because of shoulder surgery. Perhaps that is part of his problems with run blocking because shoulder injuries can have lingering effects. That is definitely something he?s going to have to have checked out prior to the draft. Alex Barron is a very good tackle prospect that has a great deal of upside. He has the natural gifts you look for in a tackle, and the athleticism you cannot teach. With a little time, Barron could be a very good NFL left tackle. He looks like Kenyatta Walker when he left Florida a few years back, though he is a better pass blocker than Walker was. I wouldn?t call Barron an elite prospect, but his upside may be as high as anyone?s in the draft. He should be a first round pick, and could very well hear his name called in the Top 20, with an outside shot at the Top 10. Jammal Brown has lead a talented offensive line that has cleared the way for some talented rushing attacks. Brown was a big part of Quentin Griffin?s 1,880+ yard season two years ago, and this season?s freshman sensation, Adrian Peterson?s coming out party. During his junior season, he only allowed one sack all year in the passing game. Jammal Brown is a talented, all around tackle. Oklahoma has a balanced offense, and it has allowed him to develop himself in both run and pass blocking. As a pass blocker, he shows good agility, and has long arms to keep the defender away from his chest. Physically, Brown is a very good athlete, with very good lateral agility. His long arms allow him to keep the defender off his chest. Brown plays right tackle, but his athletic skills should allow him to move over to the left side in the NFL. While Brown is a good all around tackle, run blocking is an area he can work on. He needs to get stronger and more physical in this aspect. He can run block, but he doesn?t play with a great deal of power and doesn't dominates at the point. There is the ongoing question of if he can play left tackle in the NFL as well. Since he?s played RT for his entire career, it brings about the question of how well he would translate to the other side. I think Brown is a very good offensive tackle prospect. I think he is a safer pick than Alex Barron, but doesn't have the upside Barron has. He looks solid as a first round pick, just how high will depend on how well he performs on the workout circuit. I think he is better suited to play LT in the NFL than RT, but he brings the versatility to play both sides, and that adds to his value. I got these from footballsfuture.com I like Brown only because he can play both RT and LT. I would love to see us draft elton brown but he isnt worth the #10 spot. Elton Brown's had some injuries in the past that seem to keep flaring up. He'd be somewhat risky. Baas and Brown are rated closely but Baas is more versitile...it's a toss up. Hopefull, one will be around by the time we pick in the 2nd. i'll take an offensive lineman over a defensive end, so give me the red barron. Millen seems to love players who have lost stock due to injuries. Mixed results, gets good talent but players also miss loads of time. 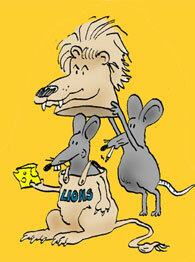 Lions biggest weaknesses is for sure on the O-line. Pablo everything you said, I agree with. Time to restock the O-line via draft. If we go D-line though I think I'd like to see Marcus Spears because of his ability to play pass and run + size/speed combo and ability to play DT or DE. I dont really like the rush linebacker style DEs as much, they are good athletes but usually not good enough football players to play except in obvious passing situation. Tend to overpenetrate into the backfield and take themselves out of plays, J Kearse, L Little and KGB all play like that. They are easy (simple) to game plan against and get most of their big plays vs crap teams or when a big lead is already established. J. Peppers is the exception, he is amazing. Merriman seems like that kind of player to me but not nearly as good as Peppers. After having luck with Shaun Rogers then zero luck with guys like Pinner and Staley I don't think Millen reached for one injured player during last years draft. Maybe he's no longer willing to take that risk. I hope so, I'm sick and tired of the injury bug plagging the entire squad. IMO, DE is the way to go. I understand that the OL is the bigger hole to fill but this will be the last chance the Leos have on getting a dominant DE this high in the draft. Defense wins championships and getting a good young talent here would be great. Use the rest of the picks on the OL!! except of course with either the 4th or 6th round pick, getting a quarterback! I kinda don't understand why we think the O-line is our biggest problem. Joey has been one of the least sacked QB's in the league for 2 years (even though I guess he's thrown a few too many INT's) and KJ had an amazing second half of a season due to our O-line finally working well together. Can our O-line improve....of course, but like a lot of you said, its my opinion not to use up a #10 on an OT, you can find them in later rounds. Joey has been the king of checkdowns these last three years. He would be sacked more often if he gave the wrs a better chance to get open. sry guys...just felt like saying that for old times sake.